I was told in Xian you cannot buy medicines without a prescription, so we brought anything we thought we could need. I brought a small first-aid kit, Advil, and Immodium, but we needed a decongestant. You may be able to get what you need at a pharmacy in Beijing, but I don't really know. The water in Beijing or China in general is not safe to drink or even to brush your teeth. Most hotels will provide bottled water for you. Use it, it's there for a reason. Beware at teahouses, the infamous "teahouse scam" where unsuspecting foreigners are charged exorbitant amounts for a cup of tea still seems to be going on. Make sure you order only after verifying the prices. A man we met at the airport had paid 1500 RMB for tea, roughly US$20. How many cups of tea can you drink for that? He thought or was led to believe that the charge would be 100 RMB. Learning a few basic Chinese phrases before you go will take you a long way. We listened to some tapes and took a private lesson. It was extremely helpful and nice to be able to say "excuse me" when battling the crowds at the subway, or your basic "where is the bathroom" in a time of need. More than anything else, it is a nice ice breaker, we had a great time and only said one bad word that we still don't understand! 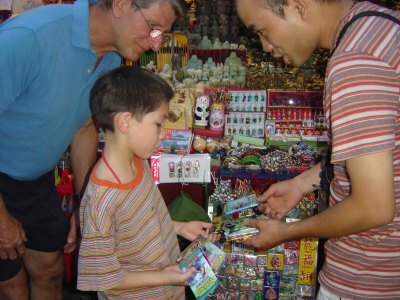 The annoying hawkers (people at the stalls selling things) can be very aggressive. We decided the best way to tackle them was to completely ignore them, otherwise you encourage them to keep bugging you. The worst we found at the Forbidden City, I have heard of others that had them bad at the Great Wall and at the Terracotta Warriors. Just be prepared. It really threw me that there were even hawkers right ON the wall. The day we went, we only saw three other sets of tourists in the two hours we were there and about 10 or more peddlers. The subway is simple and convenient to use. We were told and found to be true that there is always an English-speaking attendant taking the tickets on duty. Take toilet paper with you everywhere. The majority of public restrooms did not have any. Cultural Tip: It is good manners to use two hands when giving or receiving money or your business card. Translation Tip: Many Chinese are better at reading basic English as opposed to hearing you say the words. A better way to make yourself understood is to write down anything you need translated.